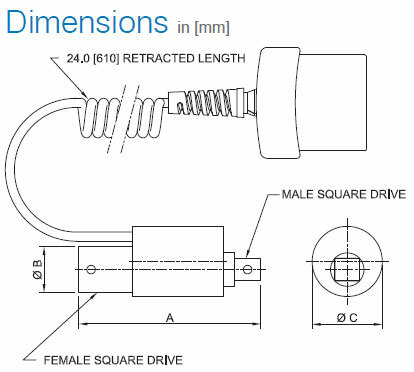 Series R54 smart sensors measure bi-directional torque for a wide variety of applications across virtually all industries. 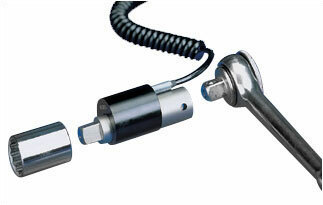 Convert any wrench to a torque tool with this sensor, or use it as a component of a torque testing system. Capacities available from 20 to 5,000 lbFin [2 to 550 Nm].Compatible with Mark-10 model 5i and 3i indicators (sold separately) through unique Plug & TestTM technology. Unique Plug & TestTM technology allows for interchangeable sensors to be used with a Mark-10 model 5i or 3i indicator. All calibration and configuration data is saved in the smart connector. The Plug & TestTM connector locks into the receptacle in the indicator when fully inserted. Dual buttons on the indicator housing release the connector for easy removal. Gold plated spring contacts ensure long lasting and reliable connection.